The Stetson Kindred of America, Inc.
Est. 1905 – Dedicated to descendants of Cornet Robert & Honour Tucker Stetson. August 9, 2018 September 6, 2018 The Stetson Kindred of America; Inc.
Our mission is to encourage and support antiquarian, genealogical and historical research with reference to the ancestors and the descendants of Robert Stetson and the area where he settled in Scituate (now Norwell), Plymouth County, Massachusetts about the year 1640, and there died on or about February 1, 1703; to publish and make available to public archives the findings of such research; to support education through the provision of scholarship grants for education to qualified candidates; to maintain in good order and condition the original land grant property now known as the “Stetson Kindred Homestead” as a memorial to the spirit and achievement of early settlers in Plymouth Colony; and to grant support to St. George’s Church in Modbury, Devon, England where Robert Stetson was christened. Honour Tucker and Robert Stetson were married in St. George’s Church in Modbury, county of Devonshire, England. During the period of turmoil preceding England’s Civil War, Robert and his wife decided to venture across the Atlantic Ocean for a new life in Scituate (Norwell) Plymouth Colony. Bearing in mind that the English military system was based upon social standing, Robert was able to bear arms in 1643 and served as Cornet, an ancient term referring to the standard bearer of a light horse, non-artillery military unit. He became a freeman in 1652 and was known as Cornet Robert. He served as a member of the War Board – during King Philip’s War – in 1658 or 1659, and as the commanding officer of the “Scituate Horse Troop,” a military unit formed in Plymouth Colony. There were only two other troops in the entire Colony. He met with the Native Americans both in warfare and as a commissioner, negotiating in the settlement of their differences with the colonists. Cornet Robert apportioned the common lands, laid out the highways and represented the Colony in establishing the line between the Plymouth and Massachusetts Bay settlements. He was on the surveying party that chopped their way through the virgin forest and swamp land to mark this boundary line. The Angle Tree Stone, near the Rhode Island border, still bears his name and marks the western end of the boundary between Plymouth and Massachusetts Bay Colonies. The site where the line crossed the ancient nomadic “Sautucket Indian Path” (that ran from fishing grounds in Weymouth to their winter camps at Bridgewater) has recently been remarked by the Abington Historical Commission to comply with “a heap of stones” that the surveying party erected in 1664. In addition to his duties with the colony and town, he was also a business man, and built his first sawmill in 1656, later burned by Natives in 1676. He also acquired lands in addition to the original tract, and it is thought that he owned extensive acreage. In 1665, Cornet Stetson was chosen ‘First Selectman’ of the town of Scituate and given authority by the Magistrates to execute and enforce his judgment and try cases involving not to go over forty shillings. The family lived on the North River and he owned three sawmills in the Scituate area. He was 90 when he died on February 1, 1702. His oldest son, Joseph Stetson, inherited and lived in the homestead until he was 81, and then sold it to Cornet’s grandson Robert. This homestead property (known as the Shrine) has been in Stetson ownership continuously through the centuries and is now owned by the Stetson Kindred of America, Inc.
A copy of Cornet Robert’s last will and testament, can be viewed here. For more information and related material, please visit the links below. The Stetson Mansion is part of Florida’s First Luxury Estate and the grandest home ever built in Florida before the 20th century. Click on the link above to learn more! Published by The Stetson Kindred of America; Inc.
Est. 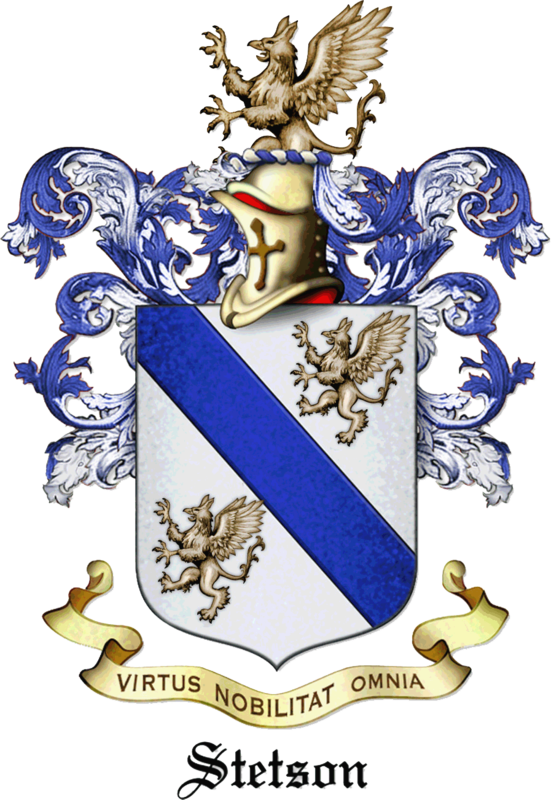 1905 – Dedicated to descendants of Cornet Robert & Honour Tucker Stetson. View all posts by The Stetson Kindred of America; Inc.
Read a biographical sketch of Cornet Robert Stetson. Read Booklet No. 1 (1907) By George W. Stetson, Nelson M. Stetson. See map and get directions to the Stetson Homestead.